Search.ydserp.com – How to remove? 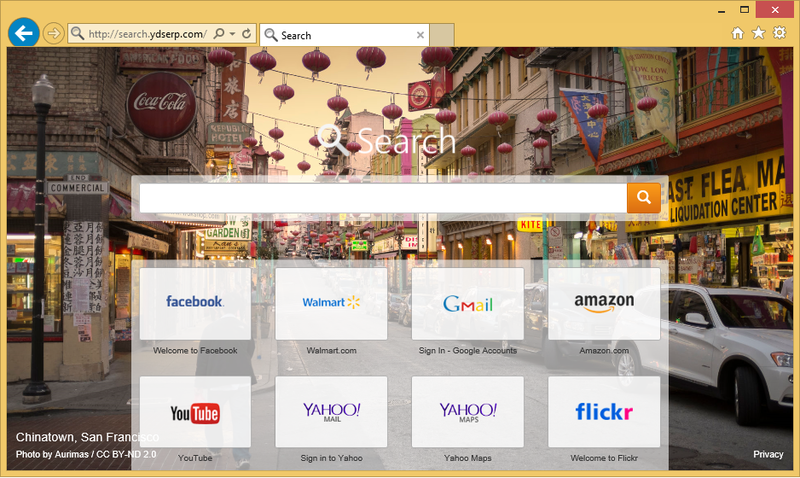 Search.ydserp.com is an unreliable website that functions as a browser hijacker. If you do not remember setting it as your home page, it means that it did so without your permission. Browser hijackers usually travel in freeware and shareware bundles. This method is frequently used by potentially unwanted apps, because it allows them to infiltrate the system unnoticed by the user. The goal of the hijacker is to promote its sponsors. It achieves this goal by disrupting your surfing with unnecessary ads, altering your browser settings, and causing other unwanted modifications. If you wish to eliminate these symptoms, you will have to get rid of Search.ydserp.com. Search.ydserp.com works in a similar way to other members of this category. The first action that it takes is switching your home page and default search engine from your preferred one to Search.ydserp.com. This site may not look suspicious as it has a search box and quick access links to popular domains, however, that does not mean that it is safe to use it. You will see sponsored content, if you make use of the search box. Some ads may appear on the home page itself. Moreover, you will encounter advertisements even on websites that have nothing to do with the hijacker. It is important for you to know that the ads you see online are not monitored by anyone. They can present you with completely false information in order to trick you into falling for a scam. You could unwittingly infect your PC with a malicious program, waste your money, or suffer some other serious consequences as a result. That is why we recommend that you stay away from all adverts until your terminate Search.ydserp.com. The sooner you do that, the sooner you can go back to surfing the Web without any worries. Your online security is certainly reason enough for you not to hesitate when it comes to Search.ydserp.com removal. You can erase Search.ydserp.com manually or automatically. The automatic removal is the one that we advise as it is more beneficial. If you implement the anti-malware utility from our page, you will be able to eliminate all threats from your system. The malware remover will perform a full system scan and detect all unreliable components. It will delete Search.ydserp.com and other unwanted files and programs. In addition to that, the security tool will provide you with online protection in real time, so that you do not have to deal with similar issues again. Alternatively, you can eliminate Search.ydserp.com from your browsers manually. You will have to uninstall its related application first and then alter your browser settings. Full manual removal guide is provided below the article and you are welcome to use it.